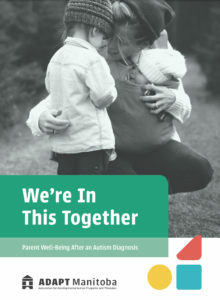 ADAPT exists to help parents learn more about developmental therapies for supporting children with autism. 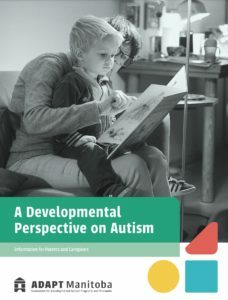 A booklet explaining what is involved in three developmental therapies – specifically, Hanen’s More Than Words, RDI (Relationship Development Intervention), and DIR/Floortime. Take a look! Click on each cover to view the document. Each is also available as a printable PDF. If you can use some printed copies, let us know. Both the printable and web copies are free to share at no cost. We hope you find them useful. We also thank Community Living Manitoba and Honest Agency for their beautiful design, including our new logo! The next part of this project: videos to explain how developmental therapies work for families. If you have worked with DIR/Floortime, RDI, or Hanen’s More Than Words and would be willing to be interviewed for an educational video, please contact us! I am an SLP in Winnipeg. At Bang a Beat Family Centered therapies we have a certified Rlate/RDI specialist as well as occupational therapists, neurological music therapists and myself a speech language pathologist.